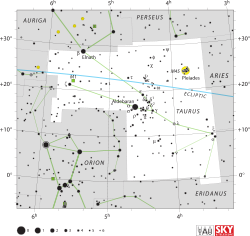 ↑ Stars with candidate extrasolar planets: Epsilon Tauri, Gliese 176, HD 24040, HD 37124, 2M J044144, LkCa 15, HD 28678, HD 285507, HL Tauri, and FW Tauri. ↑ This is Gliese 176. ↑ Russell, Henry Norris (1922). "The new international symbols for the constellations". Popular Astronomy 30: 469–71. Bibcode: 1922PA.....30..469R. ↑ ၄.၀ ၄.၁ "The latitude and epoch for the formation of the southern Greek constellations" (November 2002). Journal for the History of Astronomy 33 (113): 313–350. Bibcode: 2002JHA....33..313S. Wikisource has the text of the 1911 Encyclopædia Britannica article Taurus.